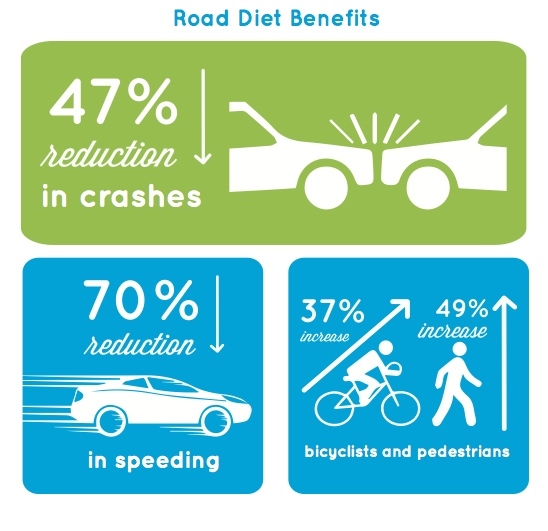 Balanced meals and reasonable portions aren’t the only type of diet that leads to the health and wellness of our citizens; many of our region’s streets need road diets. What is a road diet? Shrinking the number of lanes that cars use and then giving that extra space to other things, such as bikes or people on foot. For example, a four-lane street like the example shown can be made to include two vehicle lanes in each direction, a center turning lane, and two bike lanes. In some cases, the goal might be to add more on-street parking. More significant road diets involve moving the curb to expand the space for pedestrians Although these come at a significantly higher cost, they provide the biggest transformation. 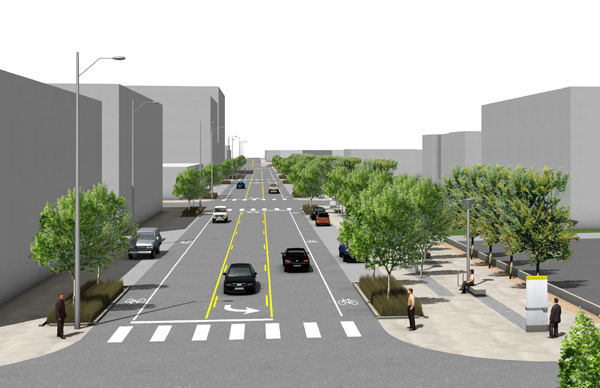 For a local example, see the plans for 20th St. in the Crossroads District of Kansas City, Missouri. 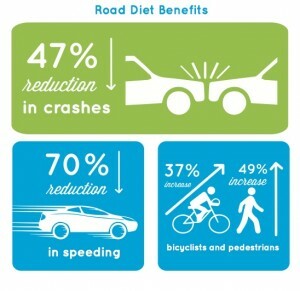 How do road diets address basic health and safety? The biggest danger to pedestrians and bicyclists is speeding cars. The threat of a fatal pedestrian crash increases exponentially as speed increases above 20 mph. The most successful walkability improvement is one that slows cars down. Road diets, like this one in Charlotte, North Carolina, are proven strategies to slow traffic and improve safety for all road users including drivers. The City of Portland, Oregon, estimates that it has prevented 37 crashes per year by implementing road diets on just three streets. Road diet benefits include a reduction of crashes and speeding, as well as an increase of pedestrians and cyclists using the roads. 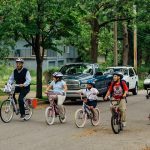 Our transportation network must provide better access to active living, and road diets are a way to accomplish this. Thanks to the traffic-calming effect that a road diet can bring, slow traffic and life on the sidewalk will flourish. Additionally, biking and walking should be part of a larger strategy to get us healthy and fit. Many people (up to 60 percent by some studies) are interested in biking for leisure or transportation but feel unsafe. These average folks need infrastructure like buffered bike lanes to increase comfort. To make us healthy, we’ve got to give streets — our most valuable public spaces — back to people! This blog post is part of A Healthy 10. 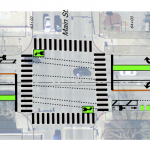 Armour bike lanes: What are those bike boxes?